In a day and age where “Freaky Fast” and Flying Drones are now delivering packages to your doorstep your friends at Bin There Dump That are keeping pace with their revolutionary Same Day Dumpster Delivery! Whether its an flooded basement, last minute garage clean out or other unexpected emergency we are here for you when you need a dumpster delivered the same day! Same Day Dumpster Delivery is yet another industry breakthrough from your friends at Bin There Dump That and we couldn’t be happier about offering this unique service to our friends through out the greater Indianapolis area! Why Wait? Give us a call for Same Day Service! The same day service is available Monday through Saturday when orders are placed before noon! Lets be honest we don’t always plan ahead and often times the dumpster is the last thing on your “Honey Do” list. Not only have we gotten plenty of husbands out of the dog house but we also have saved many contractors who have forgotten to order a dumpster on their commercial job site! Same Day Dumpster Delivery is available for any of our size bins from our 4-yard dumpster which is perfect for concrete, dirt or brick up to our 20-yard dumpster which is great for a large remodel or house clean out! Give us a call at 317-590-1973 the next time your in a pinch and need Same Day Dumpster Delivery in the greater Indianapolis area, we will be more than happy to help you out! Whenever possible not only do we recycle items in the greater Indianapolis area but we also donate them to Indianapolis charities and non-profit organizations. As a family owned and operated business who is vested in the community we love the opportunity to give back whenever possible. Whether its helping the Boys and Girls Club, Make-A-Wish Foundation, a local church group or a neighborhood clean up project your friends at Bin There Dump That – Indianapolis are there to help! Our most recent donation was to a Christian group who was helping to clean up some distressed properties for the homeowners on the east side of Indianapolis. We invite you to take a look at the video to the right to see how our dumpster helped with the clean up! If you know of a group or charity in the greater Indianapolis area, who are in need of help let us know, we are always willing to help when possible. In addition we have listed some great charities below, who do a great job in helping the less fortunate in the Indianapolis area. The answer is simple yes we do deliver dumpsters on Saturday at no extra charge! Whether it’s a weekday or a Saturday not only can you get a dumpster delivered but also picked up from your friends at Bin There Dump That – Indianapolis! As a family owned and operated business we understand that weekdays can be a hectic mess for both our residential and commercial customers. This is why we take great pride in going the extra mile for them and are more than happy to deliver a dumpster on a Saturday! Need a dumpster picked up on a Saturday? Not a problem with that either as we will be more than happy to schedule your dumpster to be picked up then as well. 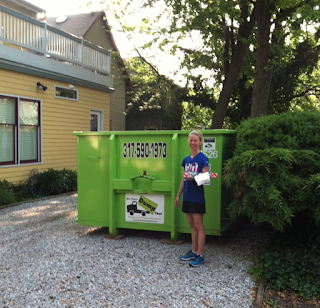 This 20-yard Dumpster was delivered last Saturday! With our unprecedented driveway protection guarantee you don’t have to be home at the time of delivery or pick up of our bins. If you would like to be that’s not a problem at all, we deliver our clean and green dumpsters Monday through Saturday from 7am to 5pm! Just let us know what day works the best for your schedule and we will make it happen! 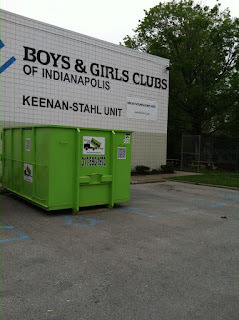 Don’t forget same day dumpster delivery is also available in the greater Indianapolis area, how cool is that! Have you been waiting for the weather to warm up and dry up before replacing the roof on your house or business in the greater Indianapolis area? Have you thought about how your going to dispose of the shingles once you tear them off? Renting a dumpster when getting a new roof is a simple and affordable way to go! Below are a couple of tips to think about when deciding on what size dumpster you will need for your shingle disposal. The first question a dumpster provider will ask is how many squares of shingles will you be replacing. A quick cheat sheet when calculating is 3 bundles equals a square in roofing terminology. The next question is there a single, double or triple layer of shingles being torn off? How many layers plus the number of squares being replaced will help determine the size of dumpster needed. For roofing jobs up to 30 squares (single layer) a 10-yard dumpster will work perfect. For shingle jobs over 30 squares but under 60 squares a 15-yard dumpster will work. The average roof being replaced in the greater Indianapolis area is 30-35 squares. One thing that sets Bin There Dump That – Indianapolis apart from many other dumpster companies is the fact that all shingle jobs are always recycled! We take great pride in being environmentally friendly and recycle whenever possible. Reusing the shingles to help pave Indiana roads is a great way to ensure the shingles don’t go into a landfill! When it’s time for you to replace your roof, give us a call at 317-590-1973. Whether you’re a homeowner or a contractor we will have the perfect size dumpster to meet your shingle disposal needs!